Earn up to 9,432 reward points. Full of features, amazing tone and a thoroughly modern and aggressive look. 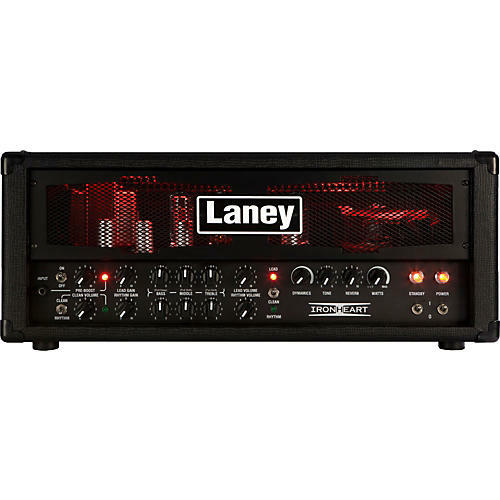 The Laney Ironheart IRT120H is a thoroughly modern tube head capable of full on metal tones but offers you far more than other metal oriented amps. It's loaded with four premium TAD 6L6 loaded tubes. The feature packed preamp is laid out logically and features three distinct channels (Clean, Rhythm and Lead). Each channel features passive 3-band EQ with push pull options for Deep, mid shift and treble shift which allows you to dial in the exact tone you are after. The master section features an overall Dynamics control which allows you to vary the interaction of the amp the drivers. Depending on the volume, an overall Tone control, a Laney custom Digital Reverb and a Watts feature allow you to dial the out put of the amp back to a whisper without destroying your tone. One of the coolest features of the IRT120H is a switchable Pre-Boost facility which functions just like kicking in your favorite boost pedal in front of your amp. This gives your playing more dynamics and feel. The rear panel of the unit features everything you need to connect your outboard gear, a variable level FX loop, a variety of extension speaker sockets and the supplied FS4-IRT footswitch connection socket. You'll also find the switch that gives you the ability to change the output tubes from the factory should you like. Finished in tough black basket weave Tolex with matching front fret and brooding red glow, it looks as good as it sounds.